The front of the store also has a row of small restaurants, kind of like the food court at Northpark Mall. My friends (Janna, Debbie and Kaylea) and I had a chance to try a Brazilian sandwich. Kaylea ate a sandwich that was kind of like a pizza sub made out of lunch meat and cheese. Janna and Debbie ate cheese sandwiches made from croissants. I had fun exploring Hiper Mart with Kaylea. 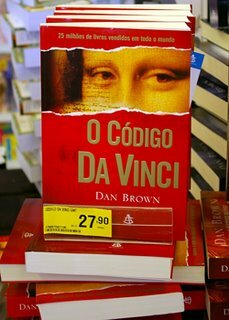 We saw lots of neat things, including Portuguese versions of some of the “bestsellers” in America, including The DaVinci Code and The Devil Wears Prada. It was fun to see “English” books with Portuguese titles printed on the front covers. 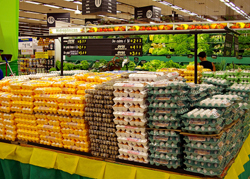 One thing that’s different at Hiper Mart is the meat counter. It is kind of like an old fashioned meat store, where everything is right out in the open. It does smell, but I guess you get used to it. We found some sorvetes (ice cream) to make a treat for the boys, and bought some pineapple and other things for supper. Well I better go, Kaylea and Debbie are going to put me to work making treat bags for a program we’re having tonight at the church. We need to make at least 100 bags for the children who will attend. Each bag will include some gum and other candies. 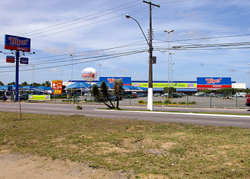 Two views of the Hiper Mart store. 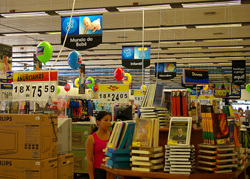 The cover of Dan Brown's book "The DaVinci Code" in Portugese could be found among the books at the Hiper Mart. 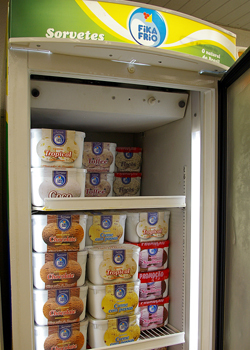 Fika Frio Sorvetes or Fika Frio ice cream at the Hiper Mart.